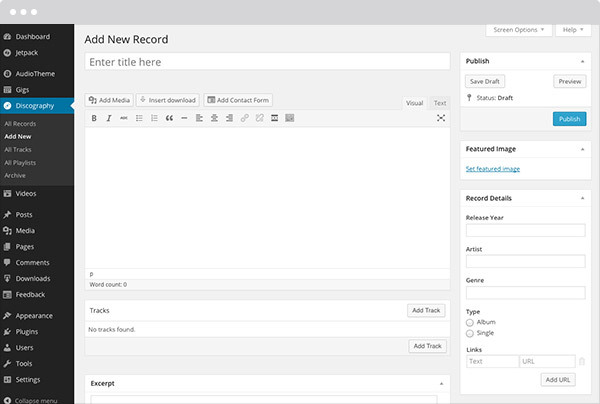 Built on WordPress, so you already know the interface. Share gig details with your fans, including: location, venue, date, time, and ticket prices. Everything you need to build your Discography is at your fingertips. Upload album artwork, assign titles and tracks, add audio files, and enter links to purchase your music. 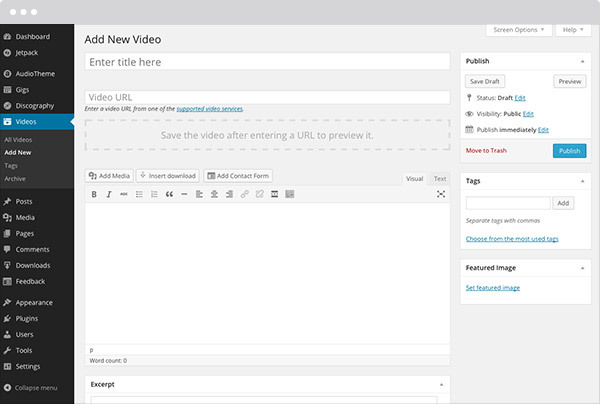 Embed videos from services like YouTube and Vimeo to create your own video library. We're here to answer any AudioTheme related questions you have with friendly, email-based support. Make any theme in our collection match the demo with no coding required. Our themes are designed to work on a broad range of devices, from mobile phones to desktop computers.